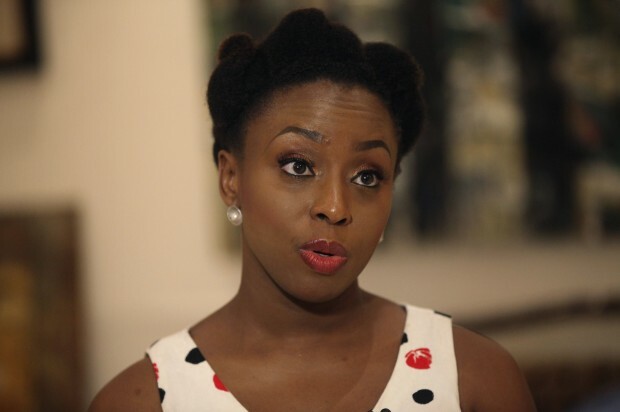 Chimamanda Ngozi Adichie knows what she knows, and also what she does not. When I asked her a question which she didn’t like, she would tell me so, gently but firmly: “I don’t know what that means,” she said, several times, and then proceeded to turn to subjects she preferred. If I prompted her to speak on a topic that tired her—when I asked her why Americanah, her newest novel, was a love story, for example—she took apart the premise of the question. Why wouldn’t it be a love story? I think it would be fair to say that she does not suffer fools gladly, and at times, my questions made me feel like a fool. But she was also unfailingly gracious and kind. After we had spoken for over an hour—the period of time allotted for the interview—I dutifully informed her that the time her publicist had given me was over, but she brushed that aside as irrelevant, and began asking me questions about myself. I told her about the classes I teach and my impending move to Texas. “You will become weird in Austin,” she said, gravely, “That’s what you do there.” She pushed me to tell her about teaching African literature at Berkeley, and was deeply interested in how my students read and react to writers such as Chinua Achebe and Ama Ata Aidoo. When I tried to bring the conversation back to her, she shrugged off the fact that I also teach a young writer named Adichie, and went back to questioning me on why I felt embarrassed that I sometimes struggle with pronouncing, spelling, and remembering African names. “That’s very American,” she said, finally. By the end of the interview, I understood something about her new novel that I don’t think I could have learned without meeting her. Like its author, Americanah can be painfully blunt, but it’s never unkind, never purposefully hurtful. And it’s meant to be funny. If she touches on uncomfortable topics—racial tension between Africans and African Americans, for example, or the silliness of white people—she does so without judgment, only deep and careful interest in the things that human beings do. She writes to understand and empathize. But most of all, she wrote this book for herself, because she wanted to write a love story about hair and race and visa applications, about Nigerians in America. She wanted to write a novel that was a little bit light-hearted, as un-serious and trivial and overloaded with superfluities as life itself. And because it is the novel she wanted to write, she doesn’t mind that much if you don’t find it funny. That’s up to you. Her job was just to write it. Aaron Bady: I’d like to start off by asking about your relationship with other African writers, and their work. And because you’re often asked about Chinua Achebe, I’m particularly curious if there were any female writers that were particularly important to you. AB: How so? What didn’t fit? CA: Well, the form, because the structure isn’t traditional. Also, you got the sense that she had fun when she was writing it. I think what I like about Ama Ata Aidoo is that she’s not interested in playing the African. Bessie Head is similar. She’s telling her story, and she’s telling the truth of her story. There’s a feminism about her that doesn’t try too hard, because it is what it is. You get the sense that she’s not saying ‘I’m making a feminist point,’ she just happens to occupy a feminist space in the world, and I love that. Two years ago she was guest of honor at my workshop in Lagos, and I just spent hours worshipping at her feet. She has a fantastic sense of humor. Anyway! I was going to make fun of some male writers, but I’m too tired. AB: You said you don’t have a secret society of African writers. AB: In some ways, you’re building one, though, with the workshop you run in Lagos. Could you tell me about that? CA: I’ve been doing that for eight years, I think, and it started because I imagine that there are many like me in Nigeria, people who want to write but don’t think that it’s viable. This bank had asked me to come and do a reading for them, and they were going to have a grand reception and blah-blah-blah, so I thought, ‘How about you use that money and pay for my workshop?’ So that’s how it started. We send out notices— anyone can apply—and we’ve had the most interesting people come, and the most interesting people apply. One man who applied to this year’s workshop fought in the Biafran War, retired, and wants to write. I have somebody select a shortlist of 50, then I select the final 20, which is very hard to do. I also do a lot of affirmative action, because I want to have a diversity of voices. I want to have people from the North and South and East and West, women and men, and I want to have people whose sentences are not very polished, because you can tell they didn’t go to very good schools, and I want to have people whose sentences are very good. And it’s wonderful to have that diversity when they come together, because you see people who would never have met, ordinarily, and suddenly they’re in this room where everyone else wants to tell stories. But the reason I love doing it is that I learn, and also that this community is created. So they go on to then form online groups, they continue to read each other’s work, and wonderful things have happened. They’ve gone on to publish, they’re writing novels, and I think it’s made writing fiction, in particular, seem doable. There are now so many more workshops in Nigeria. I think there are lots of kids who won’t feel stupid saying to their parents ‘alright, I’m going to be doctor, but I also want to write.’ In my time, it was just an odd thing to want to be and do. AB: Do those networks include other parts of the continent? CA: My loyalties are first Nigerian, but they’re very pan-African, so we’ve had people come from Kenya, from Malawi, from Ghana, and we’ve had applications from everywhere— from Egypt, even, from Morocco. Binya forces me to leave two spaces for his people, so he brings people from Kenya. I don’t have a choice; he bullies me. But I like that these cross-conversations are happening. Many young Nigerian writers have become so much more aware of other Africans than was the case 15 years ago, for example. CA: I feel like a very proud mama about all of my children, I try very hard to love them all equally. There’s a young man called Johwor Ile who is just finishing a novel, who I think is really spectacular. His novel, when it comes out, will be very good. But there’s just a lot of talent, people doing different things. AB: You mentioned that you and Binyavanga Wainaina are very different kinds of writers. I wonder if you could talk about your own style, in what ways you see yourselves as different? CA: I don’t know. I’m a bit wary of talking about my voice, because I’m not even sure what ‘voice’ means. I’m not very interested in self-psychoanalysis. I can look at fiction with creative eyes or critical eyes, and I try very much to not look at it with critical eyes, particularly my own fiction; I suppose what I can say is that I write what I like to read. In Nigeria I don’t think of myself as ‘black.’ Race doesn’t occur to me. AB: What do you like to read that you could read and think, ‘This is not something I would write’? CA: Life is very short, so I read the books that give me pleasure. And many of the books that give me pleasure happen to be realistic and do emotion and do character and do psychology, and are very situated in the world. Books in which people have to think about paying rent. I’m reading Elizabeth Strout right now, and really liking it, her most recent novel. When books are referred to as experimental, I don’t run to look them up. AB: One Day I’ll Write About This Place would sometimes be called experimental. CA: When it comes to Binyavanga, I’m blinded by love, so I would read him differently. There’s a part in that book that made me cry, when his mother dies. And another part, when he’s in South Africa, and he’s asked to go and break the news of the father’s death. It’s very, very moving when he says, “This is what it means to be African.” That they asked him is important; he doesn’t really know them, but this feeling of a shared African-ness. There’s a beautiful and sad truth about it that moved me very much. I wouldn’t think of his memoir as experimental. Maybe I’m so used to reading Bin, and fighting with him. You should have seen the early drafts of that book, if you think this is experimental. AB: What didn’t make the final cut? AB: Well, if you want to answer it I’m glad to listen! But sometimes critics seem to think that novels are just thinly-veiled autobiography. But I’m curious: Ifemelu says that she “discovered race in America,” and that she stopped being black when she came back to Nigeria. Is that your experience? CA: In other words, did I feel the same way as she did? Yes. I have many writer friends who get offended when they’re asked about the story behind the story. I don’t. Imagination doesn’t fall from the sky; you have to work with something. My fiction borrows from my life, but even more so from the lives of other people. And because I write realistic fiction, it doesn’t fall from the sky. I don’t feel threatened when I’m asked that. But yes, I’m very much like her. In Nigeria I didn’t think of myself as black. I didn’t need to. And I still don’t when I’m in Nigeria. Race doesn’t occur to me. Many other things occur to me. But in the United States, yes. Also, race is something that one has to learn. I had to learn what it meant to be black. When I first came, somebody made a joke about fried chicken, and people said ‘Oh my God!’ And I just thought, ‘Why? What’s the problem? What’s going on?’ If you’re coming from Nigeria, you have no idea what’s going on. When I came to the United States, I hadn’t stayed very long, but I already knew that to be “black” was not a good thing in America, and so I didn’t want to be “black.” I think there are many immigrants from Africa and the Caribbean who feel that way, and will say very clearly ‘I’m not black.’ There’s the overriding desire to do well, to succeed. If it means absorbing the negative stereotypes of a particular group, then that’s fine, they do it. I think also that many black immigrants don’t realize that they’re able to be here and do what they’re doing because of the sacrifices of African Americans. They don’t know the history. I didn’t when I came. An African American man called me “sister” once, and I was like ‘No, no, no, I’m not your sister, I’m not doing that.’ It took about a year of reading, learning, watching, for me to really come around and realize that there’s a context— you know, I read African American history and I’m just amazed at how recent some of the things that happened were. I’m not talking about slavery, I’m talking about 40 years ago. But when immigrants come here they absorb stories that have no context and no history. So it’s ‘oh, black Americans are very lazy. They all live in the inner city because, you know, they don’t want to work hard.’ Sometimes you’re in a gathering of immigrants, and some of the talk can sound like you’re in Alabama in 1965. It’s very depressing, because I’ve come to deeply, deeply admire African American history and African American people. Their story is the one I most admire, the one I’m most moved by. But then, there are different ways of being black, there are different blacks. I’ve come to very happily identify as black, and I like to joke about wanting to go back and find that man who called me sister, because I would hug him. But my experience is different. My experience of blackness is different from African Americans, and for me it’s still a learning process, because there are things that I can’t inhabit. Now I know racial subtleties, now I get it. But I don’t have the history, and it’s different. I wish there was a bit more understanding of the many blacks, and the many sort of permutations of blackness. I would like every black immigrant who comes here to take a course in African American history. But speaking of stereotypes, the African stereotypes are very easily absorbed in the African American community as well. I remember how amusing I found it that African Americans were shocked that I can speak English. Because, you know, you came from Africa. AB: There’s a moment in Americanah where Ifemelu reads all the James Baldwin on the shelf. Is that you? CA: I didn’t read all of them, not like she did, but I adore James Baldwin. There’s a line from James Baldwin, where he says that his father knew he was black— no, he says of his father, he was black and he was beautiful—he knew he was black but he did not know he was beautiful. I found that very moving. Many African Americans were made to know that they were black, but not made to know that they were beautiful. AB: As Ifemelu discovers race in America, as she’s learning the lexicons, she does it while she’s writing a blog, both explaining race to her readers and learning about it herself. Why did you write her as a blogger? CA: I don’t know. I’ve never blogged, I just wanted to have fun. AB: What made the blog fun? CA: I wanted to write about race in a way that was hopefully annoying, stark, funny, and very, sort of a ‘let’s stop pretending’ kind of thing. I also wanted it to be different from Ifemelu’s voice in her life. If you asked me to read them aloud, I couldn’t, because it’s not my voice either. It’s this thing that she constructs. It’s a persona. I don’t know what it does for the novel. All I know is that I quite enjoyed writing it. I don’t much care about the distinction between literary and genre. I read what I find interesting. AB: Is it important that her persona is anonymous? CA: Yeah. I think so. Because of the subject, because it’s about race. Race is such a weighted subject that people will often ignore what you said and focus on who’s saying it. If Ifemelu had said, ‘Here I am, I’m this Nigerian living in wherever,’ it would be read differently. Because nobody’s quite sure what she is, it becomes more about what’s been written. AB: Have you ever wanted to have a blog? CA: Not really, no. I am thinking about Ifemelu continuing her blog, but this time about Nigeria. But not really, no. AB: What blogs do you read? Who do I read now? I read Linda Ikeji, which is a gossip blog in Nigeria. I read it for social anthropology. It’s fantastic, it’s absurd. I have to say that in the past maybe two years I’ve really tried to de-internet-ize my life. So now I’ll only do email and shopping, which is very important. I want to read actual books. But before, I used to read a lot of natural hair blogs—I have this huge blogroll of women talking about natural hair, which is fantastic. I also used to read a lot of feminist blogs. I used to read, I think there was a blog called Feministing, and there was another one that I quite liked—oh lord, what was it called—it was a number of women, and I think the woman who did was, maybe she was Korean American and her husband was African American, and she would write about her stories. I used to read a number of Nigerian blogs that were just about people’s lives. Partly to steal material; it’s a very good way of conducting research. These people are writing about their lives, and for fiction writers in can be a treasure trove. 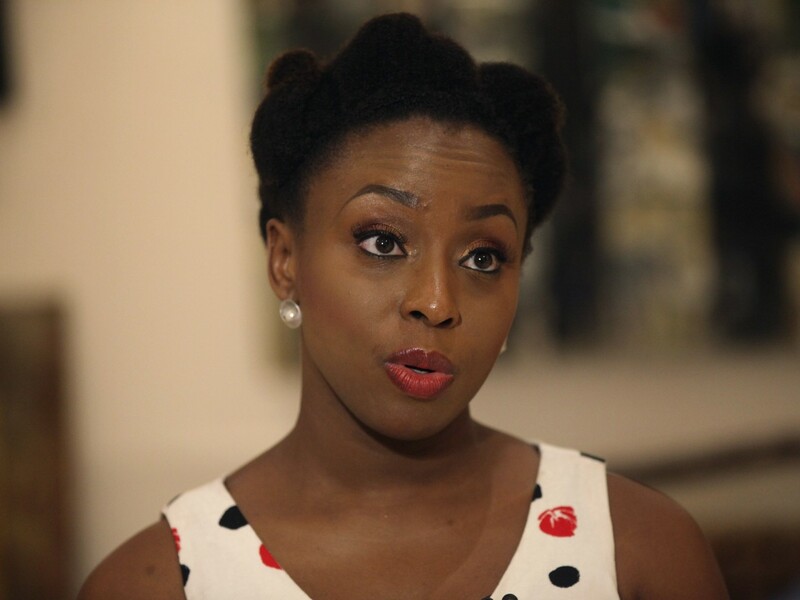 BA: Was it important that Americanah was a love story? CA: You mean why I have descended to the love story? CA: I don’t even accept the premise. It’s not as though I set out to destroy something that I didn’t agree with. I didn’t agree with it in the first place. I don’t much care about these distinctions between, for example, literary and genre. I read what I find interesting. It’s also very interesting, isn’t it, that when a woman writes a love story, it’s a love story. But when a man writes a love story . . .
CA: It’s the unapologetic lushness of the love: she wakes up and she’s thinking about him and she can’t wait for him to text, and when he doesn’t text she’s going crazy. But Ifemelu is self-aware enough to know that that is kind of funny. Also, it’s lighthearted. There’s just a lot that’s supposed to be funny. But there is also such a thing as failed attempts at humor. AB: Do you think you’re read differently in different places? Do Nigerians read you differently than Americans? CA: I think it depends on the books. My novel Half of a Yellow Sun was read very differently in Nigeria, because for Nigerians, it’s their story that I’m telling. It became history, it became politics. I heard so many stories about people reading that book and then going to ask their parents questions. Outside of Nigeria, it was just a novel. With Americanah, I think there are some parts that will make the Nigerians say ‘We don’t know what she’s writing about, but OK.’ There are some jokes that they won’t get, just as there are some jokes in the Nigerian bits that probably won’t translate well in the U.S.
[Pauses to check her phone] Sorry, I just need to read my dad’s text. I have the loveliest father in the world. He sends me these texts—and he should be asleep—it’s like midnight in Nigeria. He’s texting me to check that I’m rested, because I came from Seattle, so he wants to know if I’ve had something to eat before I do my media interview. It’s very sweet. He’s 81. Anyway. AB: Are you thinking about your next project? The next thing that you’re going to write? CA: No. I can’t say. This is where I do the mysterious yogi look. [She does mysterious yogi look.] I’m reading and I’m thinking and I’m absorbing. When you’re traveling for a book, when you’re doing this sort of singing and dancing . . . on one hand it’s gratitude that the book is out, that I even get to go on a book tour. So many writers don’t. On the other hand it’s very disorienting. Sometimes I feel as though I’m disconnected from my love of story and language. It’s a very strange place to be. AB: I would love to ask you about the Caine Prize. I find it interesting that so many Nigerians are on the short list this year—that it’s four Nigerians out of five . . .
CA: Umm, why is that a problem? Watch it. AB: Well, none of them are you! CA: Elnathan was one of my boys in my workshop. But what’s all this over-privileging of the Caine Prize, anyway? I don’t want to talk about the Caine Prize, really. I suppose it’s a good thing, but for me it’s not the arbiter of the best fiction in Africa. It’s never been. I know that Chinelo is on the short list, too. But I haven’t even read the stories—I’m just not very interested. I don’t go the Caine Prize to look for the best in African fiction. AB: Where do you go? CA: I go to my mailbox, where my workshop people send me their stories. I could give you a list of ten—mostly in Nigeria—writers who I think are very good. They’re not on the Caine Prize short list. Also, you do realize that Nigeria is the most populous country, and we have a crazy, chauvinistic nationalism. So when you say anything bad about Nigeria, we attack you, but when we all go back to Nigeria, we attack each other. That’s how it works. We’re very happy that there are four. Actually, we think all the people on the short list should be Nigerians, because we are born with the natural arrogance of the Nigerians. Of course, what’s wonderful is that there’s nothing to be arrogant about. Nigerians feel very superior to Ghana, for example, but then you go to Accra, and Accra actually works [laughs]. Who’s the other Nigerian on the short list? There’s Chinelo and Elnathan but I don’t know who the others are. AB: Well, there are four: Elnathan [John], Chinelo [Okparanta], Tope [Folarin] . . . [Note: The fourth is Abubakar Adam Ibrahim] This is where I remember that my brain is extremely American; I mispronounce names left and right. CA: Why is that American? AB: Well, Yoruba and Igbo names don’t spell the way I expect. I get it when I’m teaching African literature and my students complain that every character has an impossible name. It’s kind of embarrassing, then, when I’m doing it, too, and I know I’m doing it. CA: Why is it embarrassing? When I used to read these Russian novels when I was growing up, I had no idea how to pronounce the names, so I used to think, ok, this is character whose name starts with an I—you know how they have the Ivan, Ivanovich sorts of things—so I would just say, ok, this is the ‘I’ character. That’s actually very American, your reaction, being embarrassed. Why should you be? No, it’s very liberal. To be embarrassed that you think that Igbo and Yoruba names are confusing—but wouldn’t they be? You’re not a Yoruba or Igbo speaker. I think Polish names are confusing. The Cs and Ss, and the Cs and the Ws come too close together—it throws me off. It’s a very liberal thing. Of course, I say this as kind of a pseudo-member of the tribe. That’s the other thing, since that part of the book is also— well, there’s a lot of self-mockery, a lot of poking fun at my own tribe. My American tribe is a left-leaning tribe that occupies a place of immense privilege. Most of my friends are people who care about organic food. And I care about organic food, but I’m also amused by it, and I laugh at it. Because, you know, there’s a vast, vast world out there that doesn’t care about locally sourced chicken, right? It’s one of the things that I want to poke pins in. Aaron Bady, graduate student at UC Berkeley, is an occupant of Oakland. His work has appeared in the Guardian, Technology Review, the Chronicle of Higher Education, American Literature, Possible Futures, and his blog zunguzungu.